Every critic that I have found against the message of prosperity thinks it is only about money. They could not be more wrong. It is about prospering in every area of life: in wisdom, in relationships, in influence, in health etc… And what should we believers do to prosper? We simply need to live a life of obedience; obey his word and follow the leading the God’s Spirit. I have been a Christian for 37 years and I have seen the Lord prosper me and lead me through difficult time, include financial difficulties. You can not destroy what believers are actually accomplishing through God’s word. That is not the Prosperity Gospel, the PG says God wants you rich, and those who teach it drive Royals Royces and wear Rolex watches. “…drive Royals Royces and wear Rolex watches,”That would be an over generalization Mike; it does not apply to every PG teacher. I have read your first chapter and there is nothing earth shaking in it. I think a year from now the PG will still be going strong. And it is not difficult to see that you do not fully understand it or apply it teaching. I suggest you work on renewing your mind by meditating on God’s word, improving your love walk and learning to hear the voice of God. The you will prosper and in more ways than you can realize. I cannot put the whole book in the first chapter. Rolex watches and Royal Royces are what the big names on TV own, and it is the goal for them, to get you to be as rich as they are. But they know it will never happen. I challenge anyone to take the SCRIPTURES and prove me wrong. I don’t mean give me your false interpretation, I know that already, I mean PROVE my interpretation is false. It cannot be done, because you will have to closely analyze the text, which will force you to accept my interpretation. Ok Mike I will read your book, but just want you to know that I have been studying the scriptures for over 30 years and do believe that God wants us to prosper and have good success. When God told Joshua that it was time for him and the people of Israel to cross over the Jordan river and go to the land that He was giving them, He commanded Joshua to “Only be strong and very courageous, that you may observe to do according to all the law which Moses My servant commanded you; do not turn from it to the right hand or to the left, that you may prosper wherever you go. This Book of the Law shall not depart from your mouth, but you shall meditate in it day and night, that you may observe to do according to all that is written in it. For then you will make your way prosperous, and then you will have good success.” (Josh 1:7-9 NKJV) My question for you is this: Was God setting Joshua up to fail by promising him that if he meditated on HIs word day and night that he would prosper and have good success? Biblical prosperity is having your NEEDS met, not in having so much you can live lavishly. That is a false idea. When Jesus said seek first the Kingdom of Heaven and “all these things” will be provided, WHAT THINGS did he mean? BMW sports cars? Big mansions? NO. He named what he meant, food, clothing, and shelter. The Bible does NOT promise more than that. That is having your needs met. That is prospering. But that is not the modern American prosperity gospel view of prospering. Ok so your saying that the Prosperity gospel that you are upset with is one that promises lavish homes and expensive cars and you would probably include other expensive items as well. On the surface I accept your bias about the problems of wealth and I agree that we can squander our resources on riotous living like the prodical son. However, It still remains that it is God who gives us the power to get wealth so that His covennat may be established (Deuteronomy 8:18-19). I do live in a nice home, my wife drives a new car and I still drive my old 1995 GMC pickup.We tithe, give offerings, give alms and God has provided us with a very good household income (Malchi 3:8-12). When we have financial problems, it is never because of God, but because we have made foolish decisions. If I had not made some of the foolish decisions that I have made of the years, I would be very wealthy. Why? Because of the blessing of the God at work in my life (Deuteronomy 28:1-14). So how do you explain why Hindus and atheists also drive nice cars and live in nice homes, but the Christians in China live in mud huts are fortunate if they have a bicycle. You must be more righteous than them right? Oh, well maybe they just don’t pay tithes? Why did Paul ask one church to give an offering to another church that was experiencing a famine? If God was punishing them, why did Paul try to subvert God’s judgment? If not that, why didn’t God bless them just the same as the church who was giving the offering? I discuss all this in the book, though I do not actually ask those questions, the answers to them are there. There are people in China who prosper and there are those who don’t, just as there are people in the United States who prosper and those who don’t. There are also Christians all over the world who prosper and there are Christians who don’t. When people are obedient to God’s word and do things His way they will always prosper and have good success. You will find in Psalm 1 three reasons why some Christians prosper and some don’t. Notice there are three things that will rob a Christian of their properity. First, walking in the cousel of the ungodly. Second, standing in the path of sinners and finally, sitting in the seat of the scornful. Again, God says through the psalmnist that if we meditate in His word day and night we will be like a tree planted by the rivers of water, that brings forth its fruit in it’s season; and whatever he does shall prosper. My question to you is did God set us up to fail? You did not answer my question about why Paul asked for financial help from one church for another. It is found in 1 cor. 8. Read what two Chinese church leaders have to say in chapter two of my book, which is found on this web site. You are defending being Laodicea. You need the smoke removed from your eyes. By your definition, Lazarus was not a righteous man and it was his own fault that he was poor. Seriously, read my book. As I told another fellow, I know what your view point is, I can read those passages in the Bible too. You cannot prove me wrong by telling me what those passages say, you can only prove me wrong by reading the passages I quote and telling me they are not in the Bible. You must take ALL of the Bible, not just some of it. That is what all those who distort the Bible do. Again, to prosper is not to have all the wealth of the average American. That is NOT biblical prosperity. That is Loadicean prosperity. Biblical prosperity is having enough, not way way more than you need. I think you 2 Corinthians 8 & 9.Yes Paul is encouraging the Corinthians to give generously to the aid of the saints in Macedonia. We dop not know why they were under such great hardship, but we do know that they had given a gift that had abounded in the riches of their liberality. In fact Pasul says that they, the Macedonians gave beyond their ability to give. Actually, Michael you do not know my view point at all, nor do you know me from anyone else. In fact, I doubt that if you saw me you would even know me or any of the things that the Lord Jesus Christ has done in my life and ministry. In reading chapter 2 of your book there are things that you say that should be a warning to churches all over the world. The love of money is the root of all evil. When the children of Israel forgot their God in the promised land it brought judgment on the nation of Israel. We minister to people from all backgrounds of life and some of them are very poor, but thier poverty is not God’s judgment. Actually its been more a cycle of poverty that been in the family for generations. When discipled in the word of God and given the tools that they need in life to succeed; they succeed and become prosperous. Something most people do not notice is that Paul was saying that they would reap, not by giving to a preacher or to build a big church building, but to help poor Christians. How many offering are taken to help poor Christians in China or India? They give to themselves, their own church, and expect to reap money. Are American Christians sharing their excess with poor Christians? No, they are just expecting GOD TO PROSPER THEM. But the Bible shows us that some will not be able to have enough and that those who are able to have more are supposed to share, not keep it for themselves and saw, look at how God has blessed me, why are you not blessed too? Your comment that “American Christians are not sharing their excess with poor Christians” is again a generalization. Our congregation gives a minimum of 10% of our annual income to help spread the gospel around the world. Also, we have local benevolence ministries to help with financial needs of members within our congregation, as well as, helping people in the communities where are members live and work. Since I preach what God says in His word about finances, members of our congregation have prospered in very difficult economic times. Their increase has brought an increase in our ability to help more people who are struggling financially; i.e. help with food, utilities and medical bills etc. Also, we are starting a Distribution Center to help further these ministries. It will be a place were people will be able to come and get food, clothing, houshold furniture, beds, bedding and other household items. It even has a living area that people use from time to time. We are not unique in this. Other congregations in America give their time and financial resources to minister to people’s needs; spirit, soul and body. So how many times have you gone on a mission trip to minister to people who live in poverty? We have people in our congregation who have traveled to Mexico, Central America, South America and Africa, just in the last couple of years. There are ministries that do disciple people in Third World Countries to live by faith and guess what; the poor begin to prosper. I know that you are attacking TV ministries, but have you ever checked out ministries like Kenneth Copeland, Jesse Duplantis and Jerry Sevelle’s to find out how much of the money they raised goes to meeting the physical needs of the poor in countires like India, China, the nations of Africa and other Third World Countries? I think you would be suprised! It does not matter how much they give, when they live in Mutimillion dollar mansions, they are not living by the teachings of Christ, and they are teaching others to follow them down the path to ruin. Let me ask you a couple of questions. If a person writes a book and the book retalis for $15.00 and the royalty from that book is 25%, how much of that money is a person allowed to keep? If a person records a CD and the royalty is 25%, how much of that is money is a person allowed to keep? Let’s say that the donations to the ministry is $1,000,000.00 annually, how much is that person allowed to be paid for a salary? Just asking! Are you saying it’s ok for someone who is not in the ministry to be wealthy, while someone in the ministry is to be living a modest life? Also, how about those of us who work outside the ministry, but still draw a salary from the ministry. Do we live a double standard, keeping 50-70% of our income after taxes, tithes and offerings from our secular employment and then having to give up most of what we earn from the ministry after taxes, tithes and offerings. And then what about our spouses income, how much of that are we allowed to keep? Is there one standard for ministers and another standard for our spouses? Your missing the point Mike. How much is too much? If I remember correctly, the Levites were given 10% of all the tithes and offerings that came into God’s storehouse. Why were they given 10% of all the tithes and offerings, because they did not receive and inheritance of land. Why was there a storehouse, so that there would be meat in God’s house, both literal and figurative. What were the Levities required to give? Reference Numbers 18:8-32. Yes there was food that was distributed from the storehouse to meet the needs of the children of Israel. The Levites received their inheritance from the tribes of Israel. How many Levites were there and how many people made up the nation of Israel? God also told the Levites what was required of them to give, no more and no less. Why, because of the storehouse! Another point that is made in the scriptures was that there was provision for the poor, such as the the corner of the fields were not harvested and were left for the poor. And the point that you raise from Acts chapters 2, 4 & 6 is well taken. However, it was for the brethern, those who professed faith in Jesus Christ. Yes, we do agree on meeting the needs of people who are less fortunate than we are. I never disagreed on this point. I just wanted you to know, that eventhough I do not have a T.V. Ministry, I do have a weekly radio program called “Living by Faith” which airs live over a spanish speaking radio station. By the way, I don’t speak Spanish but they wanted an English speaking program which teaches faith and although the station is regional, through the internet has a global audience. God has blessed my wife and I and the ministries that the He has given us and our goal is to meet peoples needs, spirit, soul and body. Spiritually, by teaching the word of God and how He wants to bless us to be a blessing. Emotionally, by praying for the members of our congregation and radio audience and physically, by helping people through our distribution center and benevolence program. We believe that ministry begins in the city where we live and then to our region, state, nation and the nations of the world. If I did not believe that God blesses his servants, we would not be able to do what He has given us to do. Be sure to click on the video link for some great videos I recently added that I found on youtube.com. Televangelists Paul and Jan Crouch have faced plenty of mountains building their religious broadcast empire – among them allegations of a homosexual tryst and a prolonged battle with the Federal Communications Commission – but the most recent attack on the founders of Trinity Broadcasting Network comes from their own flesh and blood. The Crouches founded TBN in 1973 and grew it into an international Christian empire that beams prosperity gospel programming – which promises that if the faithful sacrifice for their belief, God will reward them with material wealth – to every continent but Antarctica 24 hours a day, seven days a week. It has 78 satellites and more than 18,000 television and cable affiliates and owns seven other networks, as well as its headquarters in Costa Mesa in Orange County, an estate outside Nashville called Trinity Music City, USA and the Holy Land Experience, a Christian amusement park in Orlando. On any given day – or night – viewers from the United States to India can watch Christian-inspired news updates, documentaries, movies, talk shows and sermons by preachers such as Benny Hinn, T.D. Jakes and Dr. Creflo Dollar without leaving their armchairs. The lawsuit attention comes at a bad time for TBN, which has seen viewer donations drop steeply. TBN raked in $92 million in donations in 2010 and cleared $175 million in tax-free revenue, but its net income plummeted from nearly $60 million in 2006 to a loss of $18 million in 2010, the most recent year available. Donations fell by nearly $30 million in the same period – a hit the network blames on the bad economy. At the same time, Koper’s father – the eldest Crouch son – resigned abruptly as vice president and chief-of-staff late last year. The unexplained departure of Paul Crouch Jr. roughly coincided with his daughter’s legal battle and came just months after he launched iTBN, a project to expand the network’s online and mobile reach. “They’re attempting to create a diversion and to create as much public spectacle as they can in the vain hope that this will all get resolved and that’s simply not going to happen,” he said. TBN’s reach and programming are expansive, but what is more impressive is the amount of money it receives from viewers – even in a downturn. Ministry watchdogs have long questioned how TBN – which declared more than $800 million in net assets in 2010 – spends that wealth. According to Koper’s attorney, the 26-year-old took over as chief financial officer at TBN after obtaining a master’s in business administration degree and quickly realized that its directors – her family members – were acting illegally. The Prosperity Gospel and its preachers are nothing more than a disgrace to the name of Jesus Christ.Shame on you all! This prophecy was given by a 90 yr. old woman in Norway 42 years ago about events leading up to the second coming of Christ. An Evangelist by the name of Emanuel Minos wrote this prophecy down in 1968 and thought it was so extreme that he put it away. He recently reviewed the prophecy and was amazed that it is not “extreme” anymore–but the norm in our society. Read the prophecy below. When these words had been proclaimed, people stood up in the congregation and asked the man to sit down and not speak such nonsense. In 1937 it was indeed nonsense to talk about oil being pumped along the Norwegian coast. Today all the world’s big oil companies are pumping oil along the coast of Norway. Norway is the world’s second greatest exporter of oil – after Saudi Arabia. Sad to say, the only thing that will break the back of this falsehood is 4-fold judgment of God. Yes, unfortunately when it happens it could be the end of TBN, or economic problems cause people to open their eyes and TBN reforms. It would be better if they reformed voluntarily but they will not. I just read this book and wanted to leave an evaluation. All we need to do is read the Gospels, to know what Jesus taught about money. 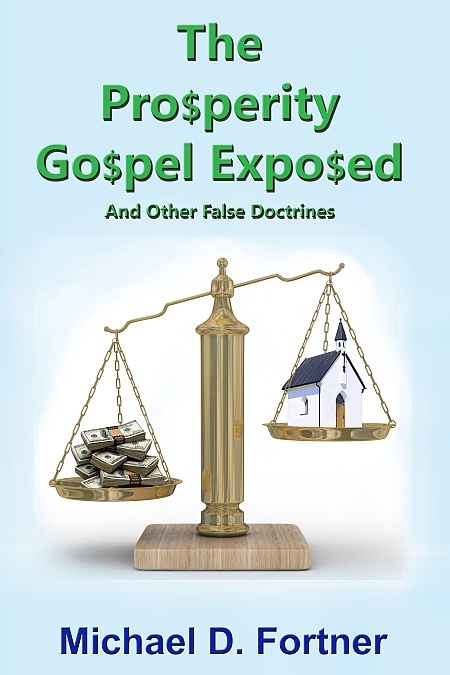 It is quite easy to see the prosperity gospel is false doctrine, or scripture being completely taken out of context. Our prosperity is one of Spiritual prosperity (a calm mind and heart, peace in the midst of trials), you see that is what having a relationship with Jesus is all about. He will always take care of our needs. The great commission is our mission. (He helped to bring out through research more of the truth on what these ministers are hoarding up thank you). I was disappointed when he begins to put an ok on the prophecy movement. There was a lack of true research on old time revivals and his discernment of them, those that were of God and those that weren’t. He puts a stamp of approval on these crazy visions, and acts of dancing and laughter etc. laying hands on each other to transfer the anointing. ( You see I John 4 says He gives us the anointing when we become His.) There is nothing in The Word about holy laughter, slain in the spirit, people screaming and yelling. God is a God of peace not one of confusion. (Read Corinthians) The Pentecostal Movement is one of confusion. He goes on to to give his own visions, and all of this is adding to the Bible, we were told to not add to it. Ending times have already been prophesied in the Word, either all the Word is true or none of it….he is still basing some of what he believes on experiences. Experience must not go outside of The Word. What happened in past revivals or in your church yesterday, if it did not line up with the Word, it was not of God, to make excuses or try to reason out these experiences is wrong. This is why there is so much confusion within the Body of Christ. The line has to be drawn on exactly what is in The Word. (I have been involved in the Prosperity Movement and The Charismatic Movement). Well you see, “if it did not line up with the Word, it was not of God” that is the issue isn’t it. Whether it lines up with Your view of the Word or not. There is no visions from me, there is only a dream, and dreams are given throughout the Bible, from Genesis to the letters of Paul. And it ADDS NOTHING but merely shows what mega churches are watering down the Word. Your slanderous remarks can’t be noting but the devil. You need to pick up a bible an learn the goodness of jesus;only if you knew the truth you wouldn’t have never made that statement. I wish unsaved people stop thing that preacher are surpose to be broke thats parted of the curse. I am open to correction. Please take any one of my verses that you claim I misuse and explain to me how I am wrong. How can someone buy into the prosperity Gospel when some of the most faithful of Christians are poor? Let me share my story. My hands are crippled and keep me from working, I have medical bills I can’t pay, and I live on food stamps. I do not own a vehicle, My “income” is 160$ a month my family pays me to clean to the best of my ability..Yet I say to you I am blessed. I have a Wife and daughter who love me and do not care that I am poor. I have always had food to eat and a roof over my head. I am not saying I am of the most faithful, but there are people of great faith living in similar conditions. I am living a more righteous life than ever before, and I am poorer than ever. Happy and needs are met to be sure, but my bank account is empty. To me PS is saying poor Christians are not as righteous as the next and that is simply not true.